An organic gemstone with a spectacular flash of iridescent colors! Gem-quality Ammolite produces a spectacular display of iridescent color when it is observed in reflected light. The colors of an individual stone can run the full range of the visible spectrum or be limited to just one or two colors. The color display can rival fine opal and labradorite in its intensity and beauty. Ammolite is a trade name given to a thin iridescent aragonite shell material that is found on two species of extinct ammonite fossils (Placenticeras meeki and Placenticeras intercalare). Other less-frequently used trade names for Ammolite are "Calcenite" and "Korite." It is also known simply as "ammonite shell." 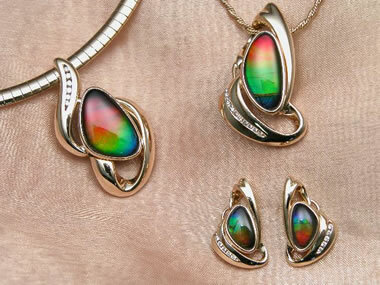 Ammolite jewelry: Ammolite triplet cabochons used in two pendants and a pair of earrings, all with diamond accents. The jewelry and Ammolite gemstones were produced by Korite International. Photo used here under a GNU Free Documentation License. 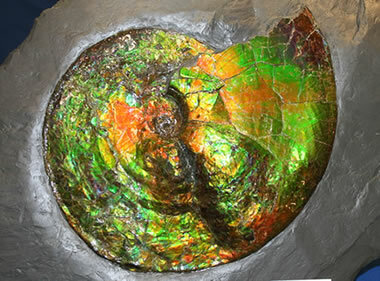 Iridescent ammonite fossil: An ammonite fossil with iridescent shell material (Ammolite) mined from the Bearpaw Formation of Alberta, Canada and expertly prepared for display as a fossil specimen. The color-producing shell layer of Ammolite is usually very thin (often less than one millimeter) and attached to a dark gray to brown base of shale or siderite. Exceptional pieces can be cut into gems without stabilization. Most Ammolite is used to produce triplets. These are made by backing the fragile iridescent material with a thin slab for stability and topping it with a transparent cover for protection. The best stones: 1) produce a vivid display of multiple colors; 2) have a strong iridescence that can be observed from a wide range of angles; and, 3) have a pleasing pattern of color with minimal interruption by gaps, inclusions or fractures. The highest quality rough is usually cut into freeform shapes to produce gems of maximum carat weight. These are used in designer jewelry. Other grades of material are cut to standard shapes for use in commercial jewelry. When assembled stones include a clear cap, it normally has a minimum amount of doming to provide the best view of the Ammolite below. A small number of stones have a faceted cap for customers who like that appearance. Uncapped stones are best used in earrings, brooches, pins and pendants where abrasion and impact are less likely. This is because the material is soft (H: 3.5 to 4), brittle, and can cleave upon impact. Ammolite map: A paleogeographic map showing the position of the Western Interior Seaway in which the Bearpaw Formation and Ammolite-producing ammonites were deposited. Image by the United States Geological Survey. The story of Ammolite begins about 70 to 75 million years ago when forces within the Earth were building the Rocky Mountains in what is now northwestern North America. The area on the east side of the mountains was covered by a broad body of water known as the Western Interior Seaway. It connected what is now the Gulf of Mexico to the Arctic Ocean. Rains falling on the eastern flank of the young Rocky Mountains washed sediments into the seaway. These sediments accumulated and eventually formed a rock unit known as the Bearpaw Formation. The Bearpaw is composed primarily of marine shale but contains some thin sandstones and layers of volcanic ash. The Western Interior Seaway contained many forms of life, including bony fish, shellfish, sharks, sea turtles, and ammonites. Ammonites (the source organisms for Ammolite) are an extinct group of marine invertebrates that possessed a tightly coiled shell similar to the modern Nautilus. The ammonites in the seaway grew to a diameter of up to one meter - but most were about 1/4 to 1/2 that size. When the ammonites died, their shells fell to the bottom of the seaway and were covered with sediment. Many of them served as a nucleus for the formation of siderite concretions which are now found in the Bearpaw Formation. The ammonite fossils within these concretions sometimes have an outer shell layer composed of gem-quality Ammolite. Mining Ammolite in the Bearpaw Formation of Alberta, Canada at the Korite International mine. Photo used here under a GNU Free Documentation License. 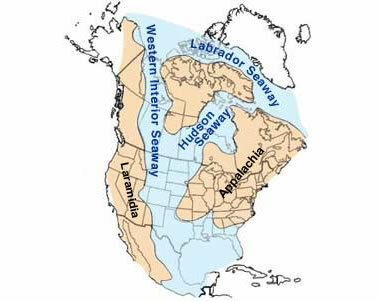 The Bearpaw Formation is exposed at Earth's surface in parts of Alberta, Saskatchewan, Montana, and Utah. The only area known to yield gem-quality Ammolite in commercial amounts is located along the St. Mary River in southwestern Alberta, but small amounts of gem Ammolite have been found in other areas. Iridescent ammonite fossils are found in many outcrops of the Bearpaw Formation, but these are often too damaged by weathering to serve as good gem materials. The best gem-quality material is found in the excavations of mining operations where depth has protected the Ammolite from weathering. Some of it still requires stabilization to be used as a gem material. Some of it is too thin for use in manufacturing. Madagascar ammonite: Iridescent ammonite shells are not unique to the Bearpaw Formation. They are found in many parts of the world. 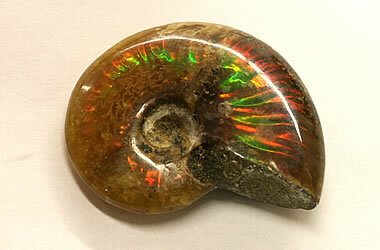 This ammonite specimen was collected in Madagascar and shows beautiful iridescent zones in its shell. The difference between most other iridescent ammonites and those found in the Bearpaw is that the Bearpaw Formation specimens have a layer of iridescence that is thick enough to cut into gems or to use in manufacturing assembled gems. This specimen is about 33 millimeters across. Ammonites with iridescent material in their shells are not unique to the Bearpaw Formation or to Canada. They have been found in Utah, England, Morocco, and Madagascar. When compared to iridescent material from the Bearpaw formation, these materials typically have iridescence that is: 1) too thin to use in the production of gems; 2) too patchy to produce a good display; or, 3) too weak to catch the eye. Color Iridescent colors that can traverse the entire spectrum - red, orange, yellow, green, blue, indigo and violet. Red and green are the most common colors. Diaphaneity The gem layer is transparent to translucent. The Blackfoot people have known about iridescent ammonite fossils for hundreds of years. They called the material "Iniskim" (meaning "buffalo stone") and used it as a talisman. Scientists from the Canadian Geological Survey described iridescent ammonite shells in 1908, but the first exhibition of iridescent ammonite in lapidary projects did not occur until 1962, when cut gems were mounted in jewelry and exhibited in a small gem show in Nonton, Alberta. In 1967, Marcel Charbonneau, owner of a Calgary rock shop, began assembling doublets of iridescent ammonite shell on matrix with a clear quartz cover and calling them "Ammolite." The material quickly became popular. In 1981, Ammolite was recognized as a gemstone by CIBJO Colored Stones Commission, and in 2004 it was named as the official gemstone of the Province of Alberta. 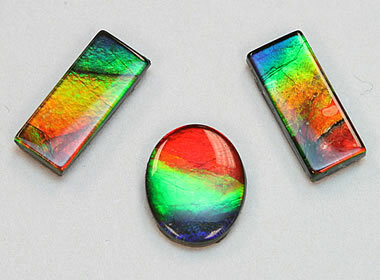 The Colored Stones Commission brought international attention to Ammolite, and its becoming the "Official Alberta Gemstone" produced enormous local popularity. Today, two companies operate Ammolite mines in the Bearpaw Formation. They are the only mines in the world that produce gem-quality Ammolite. The companies are Aurora Ammolite Mine and Korite International. Korite's marketing materials report that they produce 90% of the world's supply of Ammolite. Most of the Ammolite they produce is cut into finished stones before leaving the company. As a result, very little rough enters the lapidary market. The size of Alberta's Ammolite resource is difficult to assess. Searching outcrops does not yield reliable information because weathering has destroyed and altered much of the original Ammolite. The productive zones in the Bearpaw Formation are only a few feet thick, and the gem material is concentrated in large fossils. This makes drilling an ineffective exploration method. In areas where there is a potential for gem-quality material, the Bearpaw Formation is typically dipping. 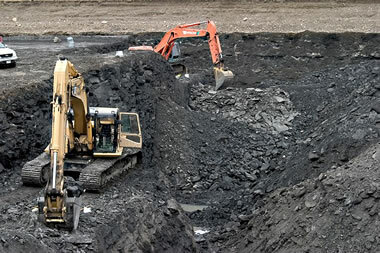 This limits mining to a thin zone between the outcrop and where the overburden is too thick to mine profitably. This limits the size and value of any discovery. Together, these facts make the long-term availability of Ammolite uncertain.